While fires have occupied the attention of Sonoma County residents this year, an additional potential disaster sits down the road in Schellville. The Northwestern Pacific Railroad (NPR) parks up to 160 tank cars filled with millions of gallons of liquid petroleum gas (LPG). It is highly dangerous and volatile. NPRR stores the tank cars laden with LPG through the winter months. Periodically tank cars are shipped to east bay refineries. Each tank car holds over 30,000 gallons. Many have described the potential horror of an explosion at the site. A simple search on the internet under “LPG accidents” will provide lists of tragedies caused by a BLEVE. BLEVE stands for Boiling Liquid Expanding Vapor Explosion. While people focus on the drama and destruction of an explosion, there is an additional threat to our sloughs, waterways, and fields north of Highway 37. The environmental damage and pollution from such an accident is immeasurable. 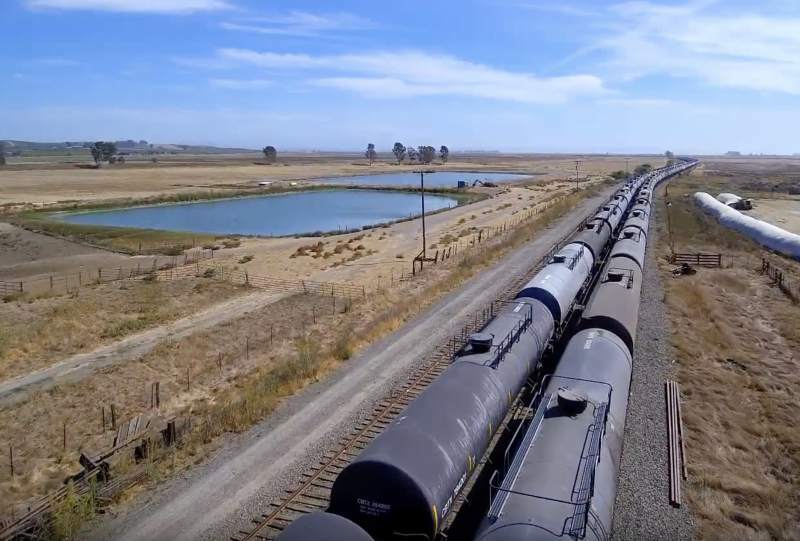 The railroad stores the 160 tank cars on tracks leased from SMART (Sonoma-Marin Transit). The tracks lie closely between two earthquake faults, the Rodgers Creek fault and the Eastside fault. The Rodgers Creek fault is an extension of the Hayward fault that runs through the east bay under the UC Berkeley campus, San Pablo Bay, and north towards Santa Rosa. Geologists indicate it is one of the most likely faults to soon cause a major quake in the Bay Area. The Eastside fault runs the length of Sonoma Valley and parallels the hills between Sonoma and Napa. In the event of an earthquake…. If the quake’s magnitude was sufficient to cause a leak or upset a rail car(s) filled with LPG a BLEVE might occur. LPG is heavier than air. It moves along the ground. If ignited it causes a huge explosion damaging all around for a great distance. Responding local fire departments would use chemicals to fight the blaze since water does not extinguish an LPG fire. Wherever the chemical compounds would flow there would be damage to earth, water, and nearby wildlife. This entry was posted in Blog on January 6, 2019 by Michael Catanzaro.